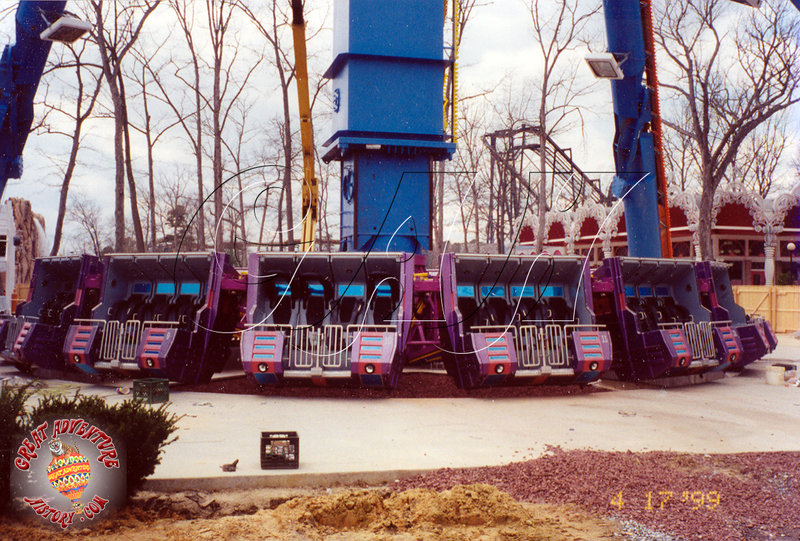 In 1997, Vekoma updated the Sky Flyer with a new version called the Air Jumper. It is a bit taller and now features open cars that use the Suspended Looping Coaster seats and restraints. Interestingly, the movable loading platform is flat and slides down once the operator starts the cycle. Then, each set of 4 rows (8 seats) is mounted on hydraulics that stretches it out and in an aerodynamic position for the cycle. It is high capacity with 16 seats per arm and two arms were installed on every version that Vekoma sold. Theming could also get interesting, as Vekoma sold a version that had elaborate clock theming. Fuji-Q Highlands (Fujiyoshida, Japan) that installed theirs in 1998 bought that model and called it the PaniClock. It is the last known operating Air Jumper in the world. The Time Warp at Six Flags New England. It originally had a yellow with tiger stripe color scheme, but it got later repainted to this green/purple color scheme. PaniClock at Fuji-Q Highlands. Notice the “clock gone crazy!” theming. The ride in mid-swing in January 2017. 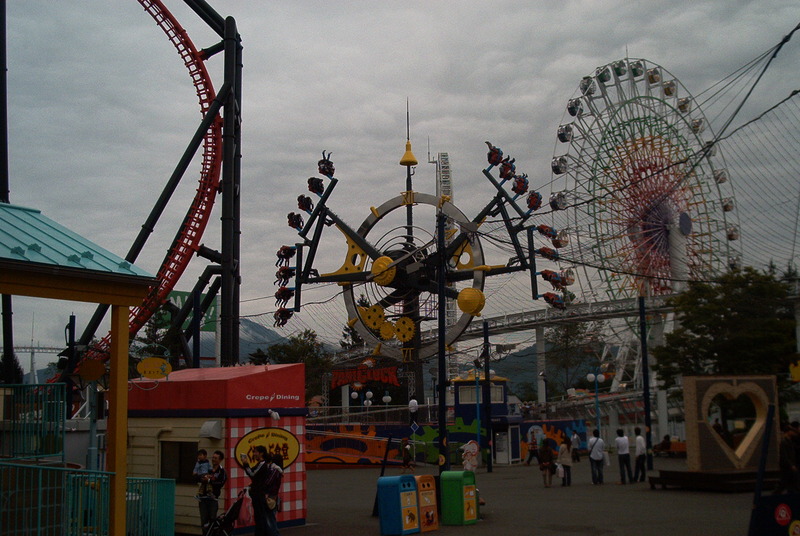 The ride has a tight location between Dodonpa and Eejanaika. The ride seats and floors that drop them down during the ride. Notice as well the hydrylics that put the seats at an angle when the ride starts. The first three models were respectively purchased by Premier Parks for Frontier City (Oklahoma City, OK) Riverside Park (now Six Flags New England in Agawam, MA) and Korakuen (now Tokyo Dome City in Tokyo, Japan). 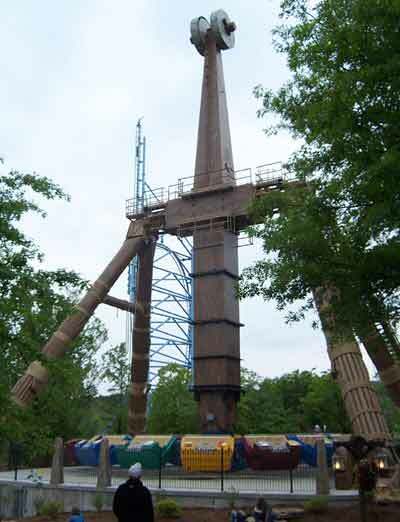 The “Tomahawk” at Frontier City was removed in 2007, the Time Warp at Six Flags New England in 2008 and the Korakuen version in the mid 2000’s. In 2000, Vekoma launched their version of an observation tower, known as the Sky Shuttle. It consists of a round disc with space for 110 passengers at one end of a boom. A large counterweight is on the other end of the boom and large hydraulic cylinders lift the passenger end of the boom in the air until it reach the 164 feet level. The passenger’s platform rotates and allows riders a 360 degrees view of the park until it lowers to the ground for unload. www.vekoma.com has this graphic that show the shape and motion of the Sky Shuttle. The first one to operate was at Luna Park in Tel Aviv, Israel. In 2001, a second Sky Shuttle opened at Suzhou Amusement Park in China. In 2001, Vekoma was part of the team of suppliers that helped the “Rhino Rally” attraction at Busch Gardens Tampa (Tampa, FL) come to life. After a thrilling rally through the savannah where riders saw rhinos, elephants and many other animals aboard custom 17 passengers Range Rover trucks, our driver and not so helpful navigator got lost! Left or right? Depending on if the next feature was running or not, the driver would take the decision to either go left or right. Normally, it would be left and we’d reach the Vekoma part: the River Adventure. After crossing a rain forest, our driver would wait for a green light. Once all was clear, he would reach a rickety bridge next to a waterfall. As he attempted to cross it, the waterfall flow would increase and this acted as a distraction as custom brakes secured the truck to the “bridge”. It would then break away and start floating downriver, through canyons and dodging various waterfalls. This was possible thanks to the ride configuration whereas it appears we are on a free floating platform, it is in reality a cable driven and guided tow boat configuration. Due to the raft large size and high height, this was the safest way to allow the tight confines and close effects since during the “water portion”, as it was referred by the park. Once at the end, our “bridge” would stop next to another waterfall and the brakes released, allowing our driver to drive across and miraculously reach the Finish line. After that, the raft continued down the river and up a small roller coaster style lift hill to wait for the next vehicle. This was also where the transfer area to bring rafts up to the maintenance bays was located. The ride was thrilling and truly unique, but it posted several unique challenges due to the high safety requirement required when you have a free rolling vehicle spinning around in the middle of water. Also, adding water to any attraction increase maintenance time and costs and in May 2010, it was announced the Water Portion would be retired and the Canyon it used repurposed for a new attraction. 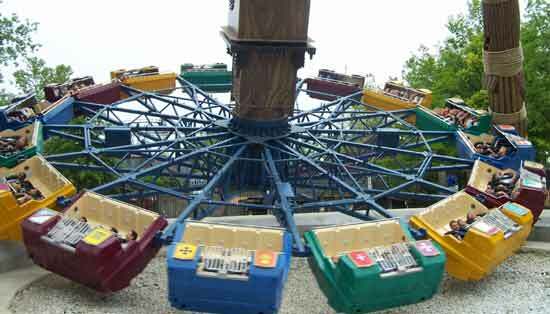 The ride itself never recovered from the loss of its best portion and was quietly retired in 2014. 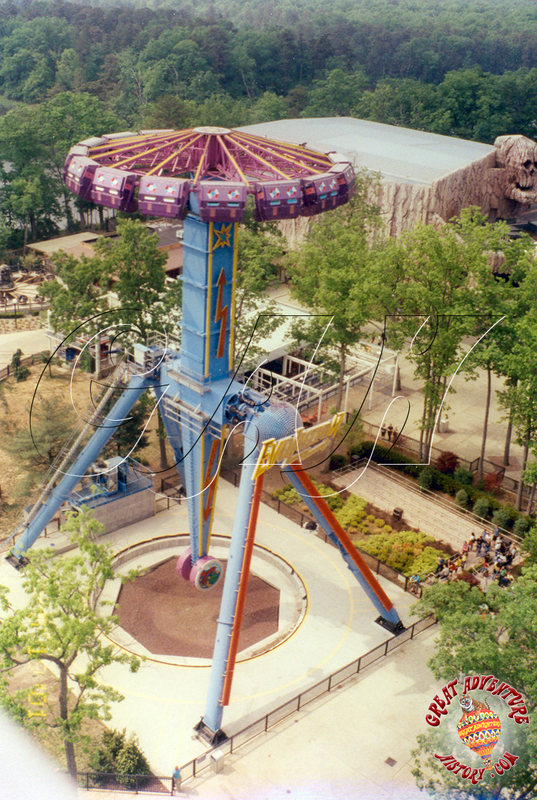 In 1992, Vekoma was one of the supplier for the Ronald Bussink designed “Evolution” spinning ride. Only 3 of those giant attractions were produced for Bussink mostly by the Bailey Company of the Netherlands. Vekoma provided the seats and restraints. 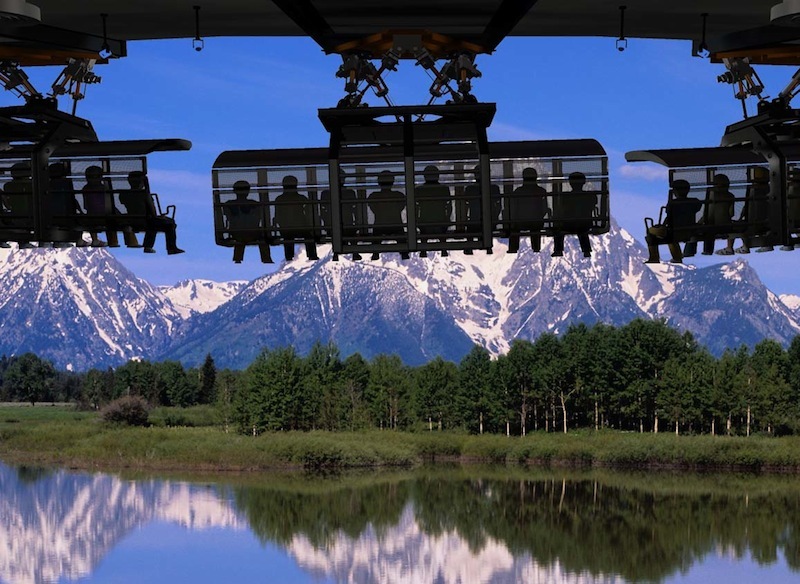 Standing 113 feet high high and requiring 16 trailers to move, this attraction featured 16 free swinging gondolas suspended at the one end of a 160 tons arm. 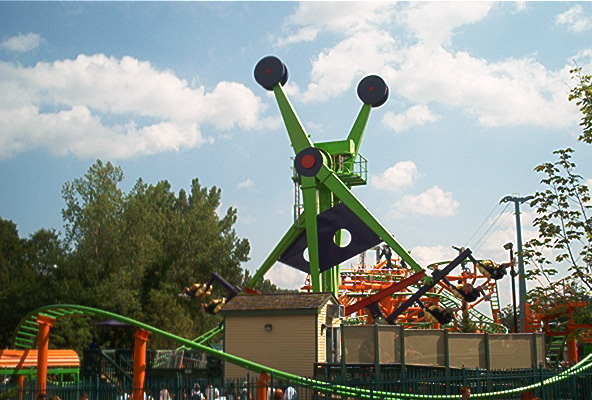 The ride would take a minute to complete an inversion, with the help of a 10 tons counterweight at the opposite end of the arm. While this was going on, the 4 seats gondolas would spin around in a similar way to an Enterprise. Remarkably, two portable versions were produced and the third one was a permanent model that went to the now closed Kobe Portapialand (Kobe, Japan). 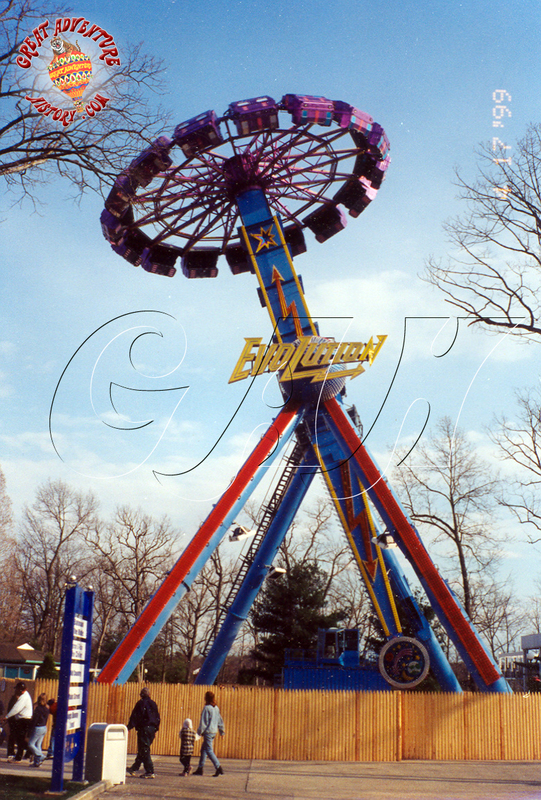 The prototype one was sold to Six Flags in 1998 and installed in 1999 at Six Flags Great Adventure (Jackson, NJ) under the name it used on the fairgrounds: Evolution. 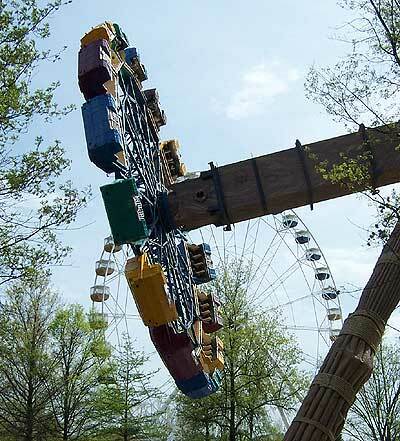 The second one was named the Imperator and after travelling a bit, spending a few seasons at the Vienna Prater (Vienna, Australia) and travelling again, it was sold to an unknown park in China. The third one was dismantled after the park closed and has not yet re-appeared. You can notice here that the same restraints and seats as the Waikiki Wave are used in the four passenger gondola. A few of the gondolas are seen here when the ride was not operating. The ride as it is about to go upside down. The arm fully inverted. Riders are not inverted as this point and get a strange view on the park from over 100 feet in the air. The gondolas require a lot of clearance throughout the ride when it swing close to the ground. So, you can see the large pit that is visible during the ride. The reason why I talk about Evolution at this point is that while it was at Six Flags Great Adventure, the park could never quite figure out the complicated operator panel and the ride complicated electronics and mechanical working. So, it barely ran at that park and after the 2002 season, it was decided that instead of scrapping the ride, it would be moved to a sister park and Vekoma was called in to “simplify” the ride and make it run reliably. Vekoma did a complete reconstruction, re wiring and general modernization of the attraction. 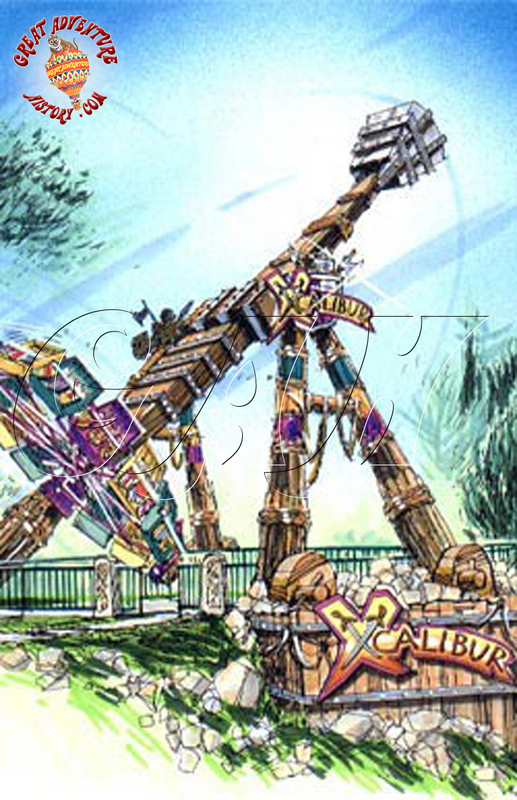 It was also redressed visually and the park renamed it the “Excalibur”. 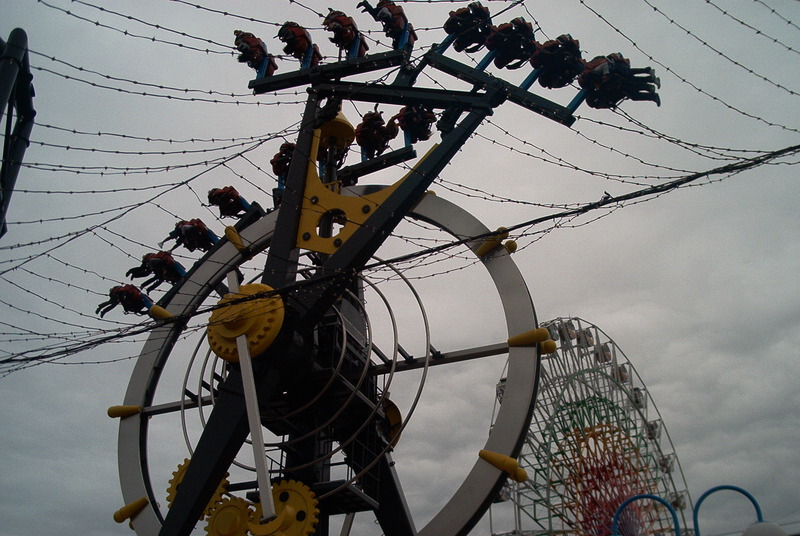 It premiered to the public in 2003 and is still today the park’s premier non roller coaster attraction. It is very popular, reliable and just a generally incredible experience. The new ride sign at Six Flags St-Louis. The repainted and themed ride cars. The gondolas have started to spin at this point. The arm has started to swing and you can see why such a deep pit is necessary. The ride in mid swing. Giant wheels were re-launched in 2005 and Vekoma manufactured a large Ronald Bussink Ferris Wheel for the Qasba Development Authority in Dubai, UAE. This was followed by the purchase of Ronald Bussink “Wheels of Excellence” range by Vekoma in 2008. Vekoma then created a separate division called Dutch Wheels B.V. This was done to market the product as something that could be a profitable stand-alone attraction versus a pure theme park attraction. Previously, the last Ferris Wheel Vekoma had produced was in 2000 for Six Flags Holland (Biddinghuizen, Netherlands) which is now Walibi Holland. Around 2008-2009, Vekoma started representing a Taiwanese company called Brogent Technologies. Brogent Technologies is a young company that was launched in 2001 as a media creator. Today, their R&D department work together with the creative people in order to create high quality simulator, flying theaters and other media based attractions. 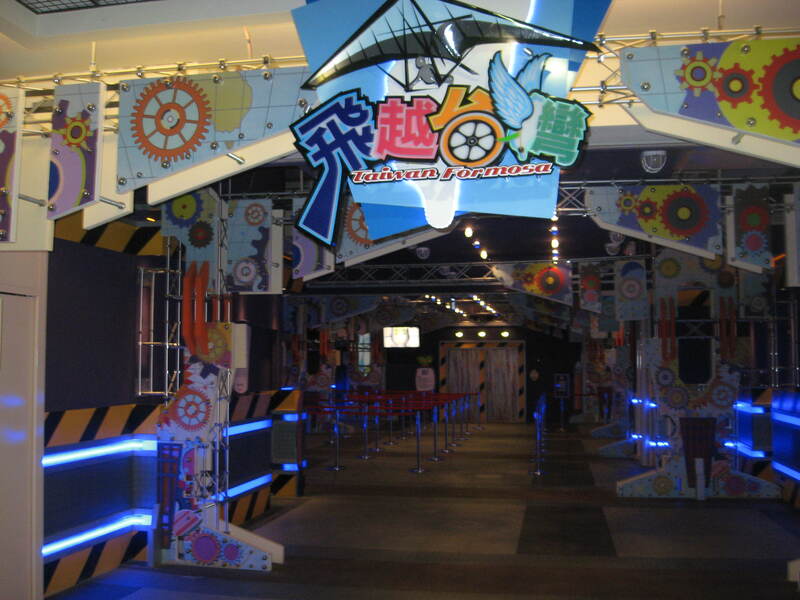 In 2010, in Brogent own city of Kaohsiung, Taiwan, Vekoma sold a 3 attractions package to a new park. E-DA Theme Park would integrate the world’s first Big Air roller coaster, a custom 50 feet tall Junior Coaster and the world’s first i-Ride/Panoramic Flight Simulator. Taking the concept created in 2001 by Disney and launching it to the next level, this attraction takes 45 riders on a beautiful trip over Taiwan breathtaking scenery. For “Taiwan Formosa”, the configuration retained by the park was 9 cars of 5 on 3 levels. This gives great flexibility, as on slower days, one or two level can be closed and thus, you reduce maintenance and running costs. For this ride, the cars have six “Degrees of Freedom” and are suspended from above. After loading, they push out and hang above the wrap around screen. Later versions still feature the full 6 “Degrees of Freedom” and those ones are electrically actuated, versus the prototype which used a hydraulic system. Taiwan Formosa entrance and waiting line. While waiting, a few of the park’s cast of animated characters entertain us. Another attraction that has not yet premiered to the world that resulted of the Vekoma/Brogent partnership is the “D-Ride”. The “d-Ride” consists of custom Automatic Guided Vehicle (AGV) that drive around an immersive dark ride. One example that Brogent propose uses 20 feet tall wraparound screens to truly bring riders inside the experience. Low mechanical noises give more flexibility to the designers, as the car can become a silent player in the story. Dutch Wheels recently launched a new line of wheels known as the DW-60. Standing 60 meters tall (196 feet tall), the first wheel in this line is a whole new design that incorporates huge 10 passengers gondolas. This provides better comfort for riders as well as increased revenue for the operator. 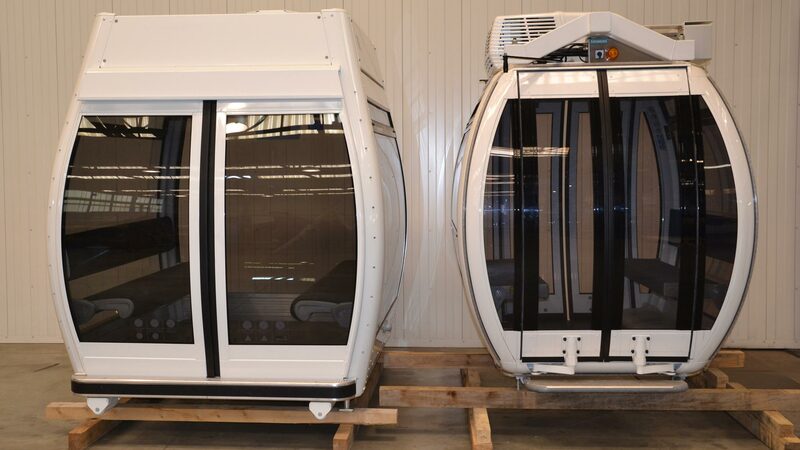 Those gondolas are also weather controlled and the whole ride was built to fit any requirements and local regulations. To go with the times, the Hong Kong wheel also features Wi-Fi in every car! The first DW-60 was installed in early 2014 in Baku, Azerbaijan. The second was installed in Hong Kong and was to originally open in September 2014 near the Central Ferry Piers. 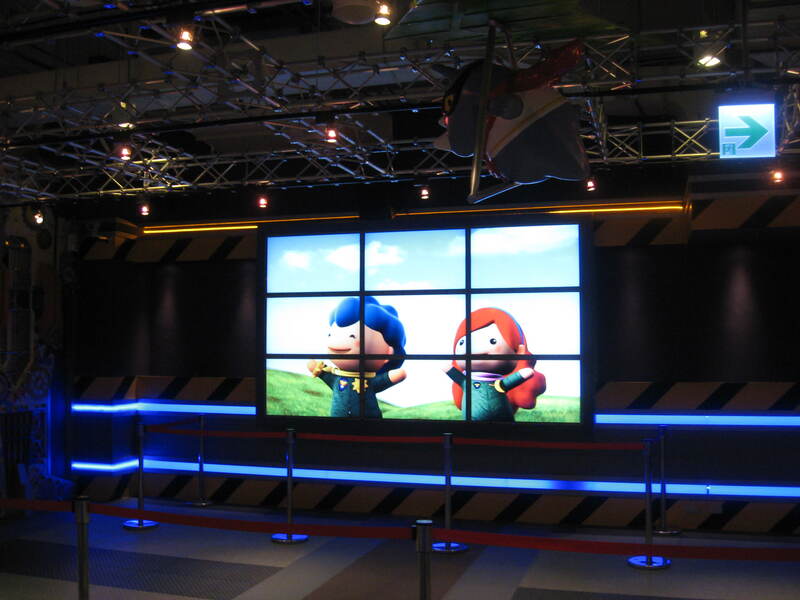 It finally opened to the public in December 2014 and each ride cost 100 HK$ per adult and 70HK$ per child. Concept art of a DW-60 installation. The DW serie 10 passengers Gondola. They will have heating in colder seasons, A/C in warmer times and Wi-Fi can be installed at the client’s request. On-Board sound is also possible. As this is meant to be a living History page, our Vekoma retrospective and our other pages will be updated as new information and pictures come around. The Hong Kong Observation Wheel opened on December 5th 2014 and is a 60 meters (196 feet) White-Series Giant Wheel. Equipped with 42 gondolas, it was installed near Hong Kong Station and is a specifically a WS60-42. This entry was posted in Industry Profile and tagged D-Ride, E-DA Theme Park, Giant Wheel, I-Ride, Panoramic Flight Simulator, six flags, six flags great adventure, Six Flags St-Louis, Taiwan, Taiwan Formosa, Vekoma. Bookmark the permalink.